If a tree falls due to a covered peril and damages your home or other insured structures (ie., a fence, detached garage, shed), your standard homeowners insurance policy covers the structures. What about my personal property? Is it covered? Your standard homeowners insurance policy will also cover damage to your contents, such as patio furniture, barbecue grills, lawn chairs, etc. 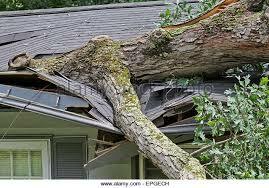 Consider that often a tree comes through the roof; damage to contents inside will also occur. Those with an inventory will be able to prove ownership and value of these items that were damaged or blown away.